When Rocky arrived two weeks ago, he was extremely timid. We have been working on his social skills with some encouraging results. He has begun to allow himself to trust us at times, but still remains guarded most of the time. He has become fast friends with our Pug Wrigley, sharing sleeping quarters (our bed) and feeding time without issue. He has a playful side to his personality, and it is fun to see that come out. Rocky has had a few problems when it comes to house training, but a new routine sometimes requires a bit of time and patience. All in all, Rocky is a delight to have around and in short order will be ready to join a forever family as a member. We will continue to work through his trust issues that he has with people, and will enjoy spoiling in the meanwhile. -Foster home update. Rocky seen here in red, with his buddy, has made remarkable progress with his socialization . He still has work to do, but he is showing he wants to be a part of a family. Being a breeder surrender, it is quite possible Rocky has lived most of his life not knowing affection. It is rewarding to see him begin to trust. We love having him with us, but Rocky deserves the love of a for-ever family. He has proved himself many times over when it comes to house training. He craves opportunities to snuggle up and cuddle either in bed or on the couch. He has a definite playful side. 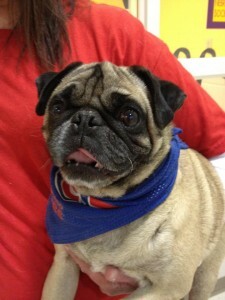 And best of all, Rocky, like a proper Pug, is more than willing to be spoiled. I don’t think he has found a treat that he doesn’t love. And did I mention he is adorable.